And Finally the Record Breakers. These are my final pair and their location is by the ford in Hardwick Village. 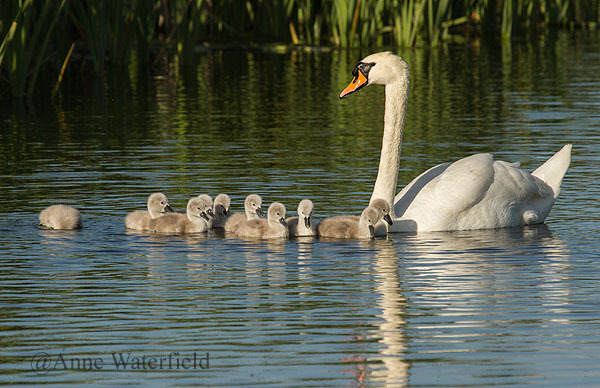 2015 was an amazing year for the Ford pair, I couldn't believe it when I saw how many Cygnets they had. Although there are 10 in the photograph I am sure they started with 11, for many months they raised 10, but now in January they have 7, that is still really good going. Again this pair don't have the stress of other Swans on their territory and have that area to themselves. Although the ford can be a problem with some idiots driving through it at great speed!! I have actually been on the bridge when a car drove through and ran over a coot, Not the best note to end on eh!. So I won't, I 'll just say the Swans I watch give me great pleasure and I look forward to this year.